Sam Norsworthy is only in his 20s but he’s already the manager of one of the UK’s top barbershops in one of the city’s most affluent neighborhoods: Ruffians in Marylebone. Ruffians’ first barbershop in Edinburgh was heralded as one of the best in the country and the brand has since gone on to conquer London with such speed that you’d swear it was easy. Its shops are low on fuss and high on quality and Sam embodies that, his youth and easy banter – about everything from football (soccer) to TV – belying a serious talent who really knows his trade. Sam took some time out to offer us some inside information on how to make the most out of your trip to the barbers. Like most 16-year-old school leavers, I’d no idea what I wanted to do, but the thought of another two years of full-time education didn’t appeal in the slightest. At this point, it hadn’t even crossed my mind to do hairdressing. This was ten years ago, so a lot of the big-time hairdressers were men but where I was from, they were all girls. I fancied a girl who was on the hairdressing course and I just wanted to see the look on my dad’s face. I did women's hair dressing for a year or so and didn't enjoy it, truth be told. I didn't enjoy the salon culture that comes with it. I was fortunate enough that the lady I worked for at the time could see I wasn't really enjoying it so she put me in contact with a former employee of hers who had set up a barber shop company. From my own experiences of getting my hair cut, where I was going 10 years ago is vastly different to Ruffians. You must have seen quite a dramatic change in the industry since you started cutting hair. Yeah, 100 per cent. I can confidently say I've only ever worked in really good barber shops because I've only worked for two companies. The company that I started with, I was with them for seven years in the beginning. It wasn’t about how many haircuts you did, as long as they were good haircuts. Trying to make your money by quantity doesn’t work nowadays. That percentage of the market that views haircuts as a chore is getting smaller and smaller. So, not only have the shops changed, guys’ attitudes towards their hair and beards have changed too. Are you seeing that more people come into your shop knowing what they want? It's no secret that the barbershop we work in is an expensive one. Historically, we attracted a certain demographic of the city, your successful types for whom spending £50 was the same as someone else spending £15, in terms of percentage of income. Nowadays, I think men see their hair as an important part of their attire. These guys that would have spent £15 on their hair would have had a pair of £100 trainers on. Now they're thinking that if they’re going to wear a £100 pair of trainers, then their hair has to look nice too or they’ll look ridiculous. Hair and grooming has become as important in terms of what matters to them. So, if someone’s coming in to spend a lot of money with you and they know exactly what they want, would you tell them if it wasn’t going to suit them? We train all of our staff a lot in consultation. We're never going to stop someone from having something, but you’ve got to point them in the right direction and that’s about asking the right questions. Instead of saying, “That looks stupid, have this” you need to tell them why. You ask them what they do for a living, or how much time they have to spend on it in the morning. Some haircuts need a lot more time and a lot more products. The hair type can be important too. I’ve got very straight hair and if I want a short, messy hairstyle, it won’t do that. Someone coming in and it’s their first time in a high-end or experienced salon, a lot of them get scared of bringing in a picture. But even if the picture looks nothing like them, we can figure out what it is about that haircut that they like. My wife always makes fun of me for always bringing in a picture of someone impossibly handsome. They always are. No one’s going to bring in a picture of an ugly guy. Are more guys bringing in pictures? Yeah, 100 per cent. With social media, it’s so much easier. You can just screenshot something on your phone. In the past, you had to cut something out of a magazine and turn up with clippings, which is just embarrassing. Are there common mistakes that you find men make in terms of hair styles? A good barber should always tell you about what you’re undertaking. Just cutting the hair isn’t enough, you’ve got to show them how to do it in the morning. Sometimes a guy will want a side-parting quiff that sits perfectly but he’s someone who just jumps in the shower and leaves the house. He’s going to need an extra 15 minutes and he’ll need to buy a hairdryer and a brush. Some guys will say they can do that and others think it sounds like a nightmare. If the haircut isn’t styled the way it’s cut, it’ll look ridiculous. They end up sitting at home thinking that they didn’t get what they wanted because you didn’t tell them how to maintain it. That’s a bad haircut. It can be technically good, but if it’s not right for the person, it’s a bad haircut. How about clients who say “I don’t know what I want. Do what you think will work best”? It’s a good starting point, but I genuinely don’t believe that any person sits in my chair and doesn’t care. Everybody has an opinion. Do you get to a point with clients where there’s enough trust for them to let you loose, confident they’ll like what you do? Well, we never really drastically change people’s hair. Men tend to be very polar with their style choices; they go from one extreme to the other. A lot of guys will come in with long hair, saying they fancy a change and, all of a sudden, they’ve a grade one on the back and sides. That’s why men’s hair trends will be long and choppy one year and the next they’ll be really tight and cropped. Beards are the same. We’ve gone from big Viking beards to groomed stubble with nothing in between. Men are just like that. If something annoys us, we don’t figure out how to fix it, we just get rid of it. A lot of it is just impulse decisions. I try and figure out which bit of their hair is annoying them and tweak the style. Nine times out of ten, that’s enough for them to like it again. Is it important to find one barber and stick with them or is there anything to be gained from moving about? I do think if you find one you like and get along with then you should stick with them. When we cut someone’s hair for the first time, we can make a good fist of it, but there’s still an element of guesswork. They’re educated guesses but still guesses. The longer you stay with a barber, the more they learn about your hair and your lifestyle. Where do you see styles going in the near future? The biggest problem our industry is about to face is that for the past three years everyone’s been getting these really tight, cropped fades. A lot of barbers have been doing them relentlessly, 10 or 15 of them a day, and a lot of the newer barbers haven’t learned the scissor work. 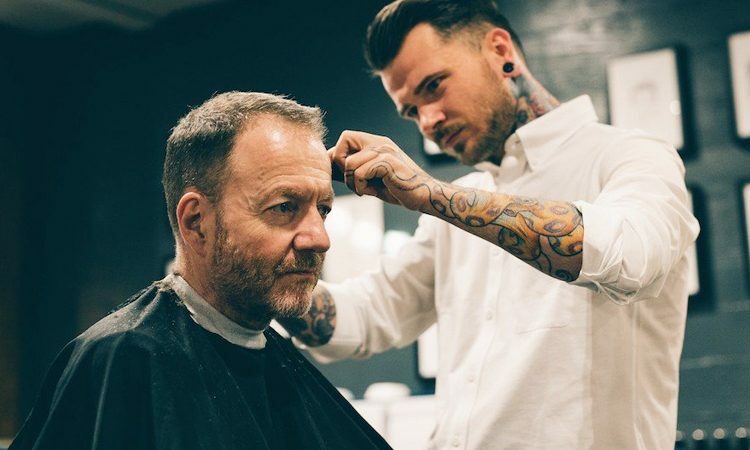 A lot of people are starting to want more texture and softer looking hairstyles, so I think a lot of barbers are going to find themselves snookered by that. I’d say 30 or 40 per cent of the barbers in London qualified in the last three years. My team have been working for 10 years plus, so it makes us look brilliant because we’ve got a much broader skill set. Not that we don’t have people who qualified in the last three years, but we’ve used the experience we have to make sure they have the skills they need.